5/25/2012 New Auto Meter Custom Bagger Gauges Coming Soon! 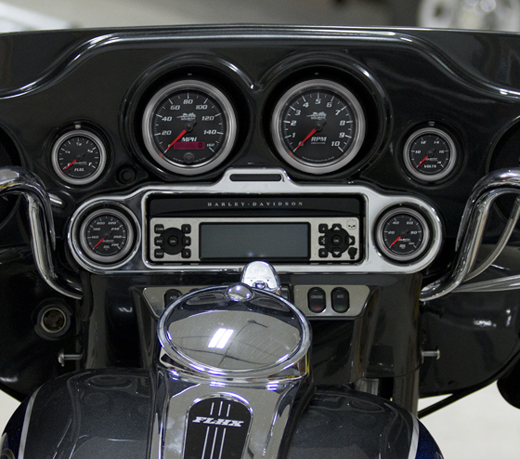 The new Auto Meter Custom Bagger gauges are on their way. A totally redesigned gauge package engineered just for your bike will soon be available from the leader in high performance gauges. Featuring highly ruggedized construction and vibration dampening specific to the harmonic signature of big V-Twin bikes, these gauges are built to take any punishment you can give out. They are also ultrasonically sealed to prevent water intrusion in case you get caught out in the rain. Using Auto Meter's state of the art digital stepper motor technology and internal microprocessor control, there simply isn't a more accurate, responsive gauge available anywhere. Official announcement coming soon!